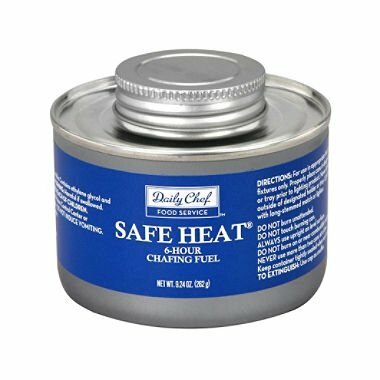 Overview: Bakers & Chefs Safe Heat chafing dish fuel keeps food hot and safe for up to six hours. This clean burning, non-poisonous product delivers a clean burning solution for all buffet, catering and foodservice occasions. The patented Power Pad feature provides performance of a gel with the safety of a wick. Its spill resistant design delivers a wider, more intense flame. The convenient screw top allows easy storage for later use. Specifications: Made in USA. Up to six hour burn time. Sustained temperature. Patented Power Pad feature. 12 cans per package. Screw top. Re-sealable lids. Recyclable steel cans. Non-Poisonous. If you have any questions about this product by Bakers & Chefs, contact us by completing and submitting the form below. If you are looking for a specif part number, please include it with your message.